Floods triggered by two weeks of intense rain have affected two million people in northern Bangladesh and left up to half a million homeless. While the country’s disaster response capacity has been enhanced in recent years, experts argue that with people displaced and crops destroyed the flooding is testing response mechanisms. "Improvement has been made in regard to flood forecasting system but there is still lack of coordination among government agencies," Mahbuba Nasreen, director of the Institute of Disaster Management and Vulnerability Studies at Dhaka University, told IRIN. A 31 August situation report by the Ministry of Disaster Management and Relief said 17 of the country’s 64 districts have been affected. Six of these districts are expected to experience rising water levels this week, and Dhaka, the capital and home to 15 million people, may see flooding as well. Nasreen explained that part of the remaining weakness is due to Bangladesh’s Water Development Board being responsible for building and repairing embankments, which protect against floods, while the Ministry of Disaster Management and Relief is responsible for reacting to disasters. This, she argued, results in lack of coordination between the two agencies. "One organization should look after the whole thing," she said. "There are still lots of things to do to improve [the] country's disaster response." According to government figures, 17 people have died due to drowning in the floods, and there have been 506 cases of pneumonia, 1,850 cases of diarrhoea and 540 cases of skin infections. Residents in the affected districts told IRIN they were worried both about the short- and long-term consequences of the flooding as they struggled to find dry ground and watched their crops get washed away. Christa Räder, WFP representative in Bangladesh, told IRIN the agencies’ assistance has focused on the distribution of nutritious biscuits, which do not require cooking. “Since 24 August WFP has reached more than 50,000 people with nutritious biscuits in the flood- and river erosion-affected districts of the north,” she said, explaining that many people have fled their flood-hit homes and are now living on higher ground or embankments, without stoves or cooking utensils. 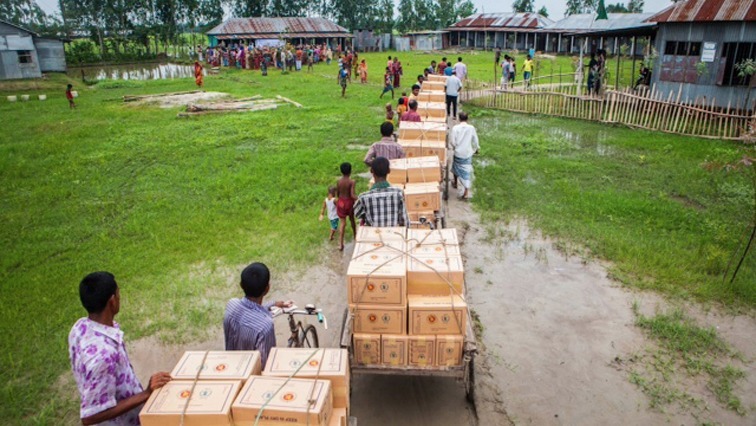 Some indicators suggest Bangladesh’s disaster response capacity has improved in recent years. While 17 people have died in this year’s floods, a similar round of flooding in 2007 killed 1,110 people, a flood in 1998 killed 1,050, and a flood in 1988 killed 2,379. The government has modernized its Flood Forecasting and Warning Centre, which now gives up-to-date flood forecasting five days in advance (as opposed to an earlier threshold of three days), as well as information online and to people who call in. Rezaul Karim Chowdhury, executive direct of the NGO Coast Trust, told IRIN the government’s response must also consider long-term relief measures. Bangladesh was hit by floods in late August and early September 2014, displacing hundreds of thousands and destroying crops. “We urge government to provide shelters to the homeless families, to provide food supply until next March as they have lost the aman [main rice] crops, and double the various safety net programmes for the affected and marginalized, especially for the fishermen families, women- and child-headed households,” he said, referring to the government’s various “safety net” allowances for older people, widows, and people with disabilities, among others. Floods in eastern Bangladesh in 2012 left thousands food insecure as water remained for prolonged periods and damaged crops severely. According to Oxfam’s Bangladesh country director Snehal Soneji, this year’s flooding is also damaging agricultural land. “The main crops aman and aush [the two main rice crops], jute and vegetables are completely damaged as most of the fields are under water for the last 17 days. Damage of main agriculture adversely affects livelihoods of the farmers in long run,” he said. Other evidence points to infrastructure damage that will have short- and long-term impacts. “Safe drinking water, hygiene kit, sanitation, cash-for-food are among the immediate needs at the time,” Soneji said, adding that Oxfam has provided hygiene kits to 600 households. Meanwhile, Bangladesh’s disaster management and relief minister, Mofazzal Hossain Chowdhury Maya, insisted on a visit to affected areas that the government was responding effectively. "No one will die without food," he said, addressing a relief distribution programme in northern Gaibandha District, state-run media reported.